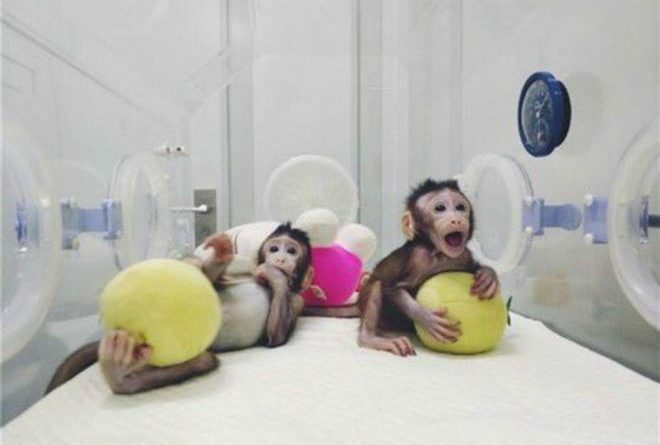 Referring to the cloning of the two monkeys (exactly macaques) by two Chinese criminals, who cannot be called “scientists” because this is nothing else that a crime against science, LIMAV Association of Italy (International Medical League for the Abolition of Vivisection) wants to express its scientific opinion. Author’s says in a statement, that “most of the animals used in laboratory to study diseases, from cancer to Alzheimer are highly hybrid mice. But mices do not develop all the human diseases or tor they develop it in a different way than it does in humans“! But there’s just one small detail missing that is that also macaques held in a research laboratory fall ill with cancer that in the human species could have a genetic or environmental cause or related to alimentary and lifestyles; all these causes have nothing to do with the monkeys who would like to live free in some forest of Southeast Asia. And it is really unfortunate to talk about disease, because for Alzheimer’s disease and other neurodegenerative diseases, there was no scientific progress, precisely because it has always been experienced on mice and macaques, never arriving at a therapy; and there will not ever be a therapy because these diseases do not exist in any other animal species than humans. So you are keep studying “nothingness”. Authors also argument that “this will create real models not just for genetic brain disorders, but also for tumors, immune or metabolic disorders “! Even worse of the statement about genetic brain disorders is that a cloned monkey could be a “real model” for immune or metabolic disorders. People who studied biology know that immune or metabolic disorders are specie specific, i.e. each species has its own immune system and its metabolism is different from that of other species. Conversely we can say that not even two homozygous twins (of any species), have metabolism or immune system that can be a real model for the other. Many scientists say that most of the clinician’s studies have failed in humans because they have been based on animal models that are not predictive for our species. Ultimately, if the result of monkeys cloning wanted to be a step forward for the scientific research studying diseases affecting humans, it was instead a leap back of true scientific progress who should improve “human based” methods, based on everything related to our species, such as cells, tissues, organs or even computer systems that are much more reliable for studies humans diseases, than using animal models (which are not real). Dr. Maurilio Calleri, Doctor of Veterinary Medicine and President of LIMAV Italia.